RINSE the lettuce if needed and use a salad spinner to get rid of any excess water. 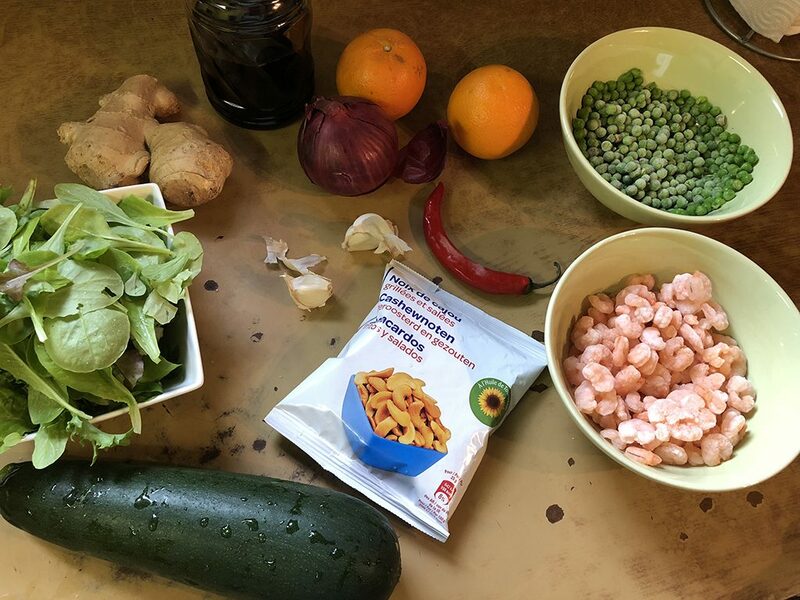 DEFROST the shrimps and peas if needed. FILL a small pan with water and cook the peas for a few minutes. PEEL the ginger root and use a fine grater to grate the ginger. REMOVE the seeds of the pepper if you like and coarsely chop the chili pepper. PEEL and finely chop the garlic cloves. PEEL the red onion and divide half of the onion into thin strips. 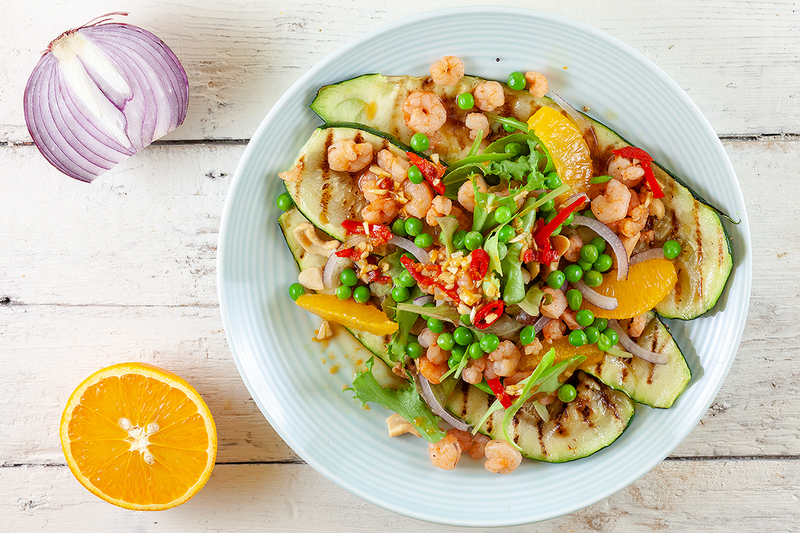 CREATE a simple dressing using the peel of both oranges and the juice of 1 orange. DIVIDE the second orange into wedges. FINISH the dressing with soy sauce, ginger, garlic and chili pepper. DIVIDE the zucchini into long strips, make sure they’re not too thin otherwise they will burn easily. HEAT a grill pan on high heat and drizzle the zucchini strips with olive oil, pepper and salt. GRILL the strips a few minutes on both sides.The exact time depends on the thickness of the strips, but make sure the grilling pattern is visible on both sides. Use the hot grill to heat the shrimps shortly. 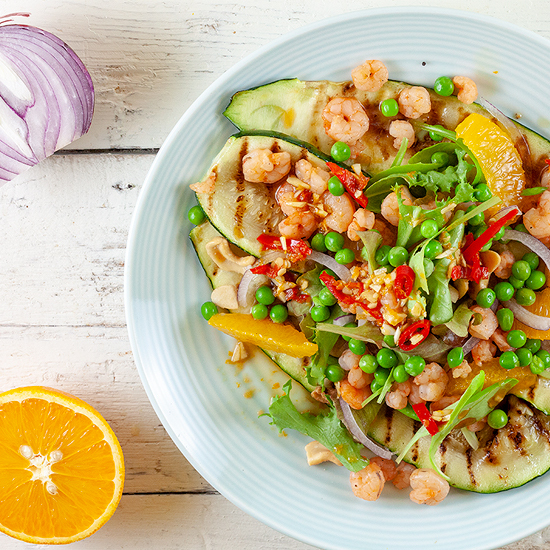 Start with a few strips of grilled zucchini on a plate and divide the lettuce, orange wedges, red onion, peas and shrimps over the zucchini. 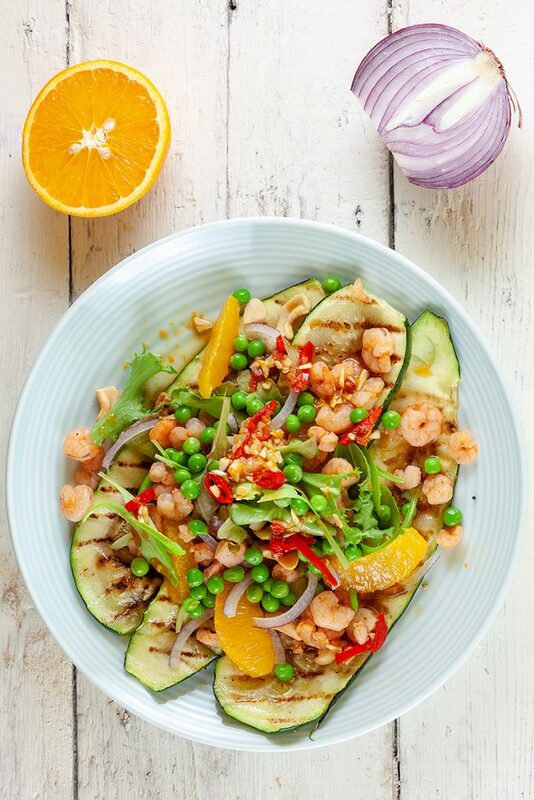 FINISH the salad with dressing and cashew nuts, enjoy!